Freaky Knitter, knitting without fear! There are done!! I am so happy and I really enjoyed working on these. They look more difficult than they are and I think you will enjoy knitting them up. 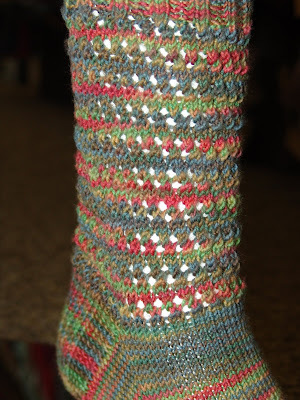 They would be beautiful in any sock yarn and are shown here in the Indie Dyer Supersock Select; Boogey Man colorway. OMG Jeannie! Those are beautiful! I want some so bad, guess I need to finish the quilt I am working on so I can get knitting! I have been a mixed media artist since I was 2 years old and am now in LOVE with the fibers arts! I have a fabulous family, friends, pets and LOVE life, so what more is there...who knows what the next moment will bring, but I know it will be amazing!!! Get the Jimmy Beans Wool Sale Spotlight widget and many other great free widgets at Widgetbox! Get the Jimmy Beans Wool Best Seller Spotlight widget and many other great free widgets at Widgetbox!